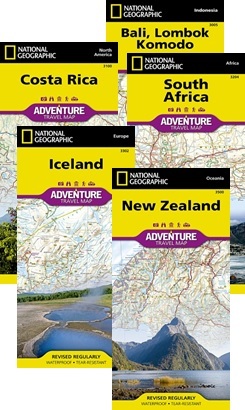 National Geographic's Adventure Map is designed to meet the unique needs of adventure travelers with its durability and accurate information. Each title provides global travelers with the perfect combination of detail and perspective, highlighting the area’s terrain and best locations for adventure activities like snorkeling, surfing, fishing, and more. Adventure Maps include up-to-date roads, points-of-interest, highlighting diverse and unique destinations within the country, and detailed inset maps for major cities, The map includes the locations of thousands of cities and towns with a user-friendly index, plus a clearly marked road network complete with distances and designations for major highways, main roads, and tracks and trails for those seeking to explore more remote regions. Adventure Maps are printed in the United States on a durable synthetic paper, making it waterproof, tear-resistant and tough—capable of withstanding the rigors of international travel. 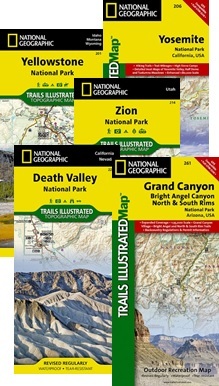 National Geographic Trails Illustrated topographic maps present an extensive series of GPS compatible, contoured hiking maps of USA’s national and state parks or forests and other popular recreational areas. These maps are designed to take you into the wilderness and back. Each map is based on exact reproductions of USGS topographic map information, updated, customized, and enhanced to meet the unique features of each area. The maps include valuable wilderness tips and Leave No Trace guidelines, along with updated trails, trailheads, points of interest, campgrounds, and many other facilities of interest to the outdoor enthusiast. With a new color palette and stunning shaded relief, backcountry navigation has never been easier. Each map is double-sided to give either maximum coverage of the chosen area or additional enlargements of its important sections. Accompanying notes provide useful information on relevant regulations, safety precautions, contact addresses, etc. 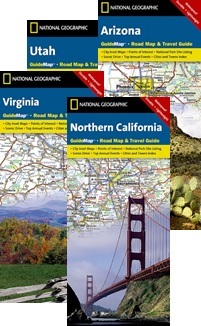 National Geographic Guide Maps combine the most reliable road maps available and detailed additional tourist information providing city maps and enlargements of popular areas, national park site listings, a calendar of local special events, a recommendation for a scenic drive, , a distance table and a climate chart.etc…One side features a detailed state highway map, enhanced with terrain detail and major city insets. The flip side presents tourist, historic, and recreation information, along with color photos, maps, and illustrations. All this folds into a convenient, durable map perfect for either vacation or business travel.